While you fill your shopping cart at Amazon, please purchase a book or two for Ballou Sr. High School's library! The wish list has many many (MANY) books that the students have requested. This is the last chance this year to get them the books they want! will have dozens of books to put on the shelves! Follow @BallouLibrary & @chasingray for updates! Cyber Monday means Round #2 for the Ballou Book Fair! We are getting ready to send more books to the library at Ballou Sr High School in Washington DC! With millions of people getting ready to shop this weekend, we are hoping to take advantage of your generosity one last time in 2017 and send even more books to Ballou. As you may know, students at the school suffer far too much from poverty and all its accompanying factors. They struggle to stay in school, to stay engaged in their studies and to persevere in the face of the area's violence. They deserve every chance that we can give them and their librarian, Melissa Jackson, is an absolute powerhouse when it comes to going the extra mile for her students. We want to make it easier for her to do her job and the best way we can do that is to buy the books that those students want and need, (and in some cases positively pine for), to fill her library's shelves. We buy books for Ballou! There are several hundred books on the list at Amazon and for those folks who shopped last month, you will see that several titles have been added in the past few days. They are courtesy the most recent email from Ballou — books the students are excited about and asked if we would add. (And of course we did!) We also moved several books that are on sale to the top of the list as they are excellent bargains right now. We hope that you will take advantage of the low prices and buy one or more of these titles. If you can't shop off the list, please help spread the word on social media. Here is the direct link: http://tinyurl.com/BookFairBallouHS. Also follow me (@chasingray) and Melissa Jackson (@Balloulibrary) on twitter for updates. Have a great Thanksgiving and we look forward to an amazing next week of book buying for Ballou! When my friend Christopher Golden announced the forthcoming The Twisted Book of Shadows anthology - which will start accepting submissions in February 2018, so mark your calendars! - I started considering what I could write and submit. That led to thinking about my favorite short stories, which is a pretty short list (no pun intended) as I tend to gravitate towards longer stories, full-length novels and serialized television. I started asking friends, colleagues, and patrons of all ages about their favorite anthologies and short story collections, and here's what we've got! 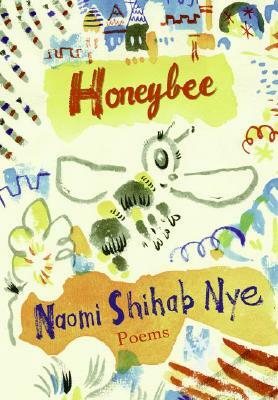 Allison seconds the recommendation for Naomi Shihab Nye, saying her work is "off all charts. I’ve never read anything by her that didn't have at least a touch of honeyed language. One of my other favorite short story/essayists is Bailey White who used to read her short stories and essays on All Things Considered. Her first book was Mama Makes Up Her Mind. Barbara Kingsolver and bell hooks are two others I love." Author and artist Sarah Jamila Stevenson, whose novels include The Truth Against the World and The Latte Rebellion, enjoyed the anthology Slasher Boys and Monster Girls edited by April Tucholke. "This 2015 anthology featuring some big names in YA literature brings a fresh perspective to classic horror tropes - and it's not for the faint-hearted. I'll never think of the Mad Tea Party in the same way again, that's for sure..."
Rachel's favorite anthology is The Best Science Fiction of the Year 3 edited by Terry Carr. "This anthology got me hooked on science fiction and fantasy when I was around 12 or 13, and I have been hooked ever since," she said. It contains two of her favorite short stories, Of Mist, Grass and Sand by Vonda N. McIntyre and The Ones Who Walk Away from Omelas by Ursula K. LeGuin, both of which she considers "still incredibly relevant today." Prompted by our conversation, she looked up the full table of contents and added, "One of the ones I'd forgotten about, that hits me in a completely different way now, is The Women Men Don’t See, written by Alice Bradley Sheldon under the pseudonym James Tiptree, Jr."
When I asked the aforementioned Christopher Golden to list some of his favorite anthologies, he included "all of Charles L. Grant's legendary Shadows volumes and Kirby McAuley's Dark Forces, which were all hugely influential on me as a teenager and into my twenties. The horror stories in those books inspired me as a writer and as a reader…and later as an anthologist in my own right." As for collections, he said, "The easiest and truest answer is that Stephen King set the bar with Night Shift and Different Seasons. If you go back and read those today - the former a collection of short stories and the latter a quartet of novellas - you'll see the master at work. King didn’t realize it at the time, but those were STATEMENTS, establishing the benchmark for weird fiction. Years later, I wrote the introduction for Joe Hill's 20th Century Ghosts and I had no idea of his parentage. I should have known, reading those stories, because that set a bar for a new generation. Others that should absolutely be on your weird or horror fiction collection list include all six volumes of Clive Barker's groundbreaking Books of Blood, Shirley Jackson's The Lottery and Other Stories, and Robert Shearman's Remember Why You Fear Me. On the fantasy side, Robert Holdstock's The Bone Forest is an overlooked marvel, and Kelly Link's Stranger Things Happen is remarkable." Thanks to Chris for giving us so many recommendations -- and for giving me a segue to share my own! I really enjoyed Golden's fantastic short story collections The Secret Backs of Things and Tell My Sorrows to the Stones. The titles are fantastic and the collections fully deliver. 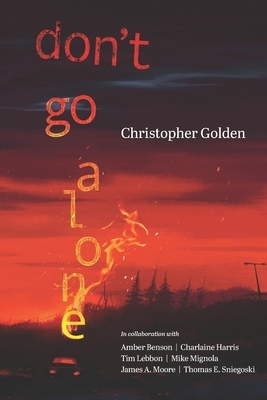 He recently released Don't Go Alone, a collection of collaborations, which includes Joe Golem and the Copper Girl (co-written with Mike Mignola and part of their series of Joe Golem novels and comics), Ghosts of Albion animated films and books), and Wellness Check (co-written with Thomas E. Sniegoski and part of their fantastic dark fantasy series The Menagerie, which I really love). Looking for books for younger readers and/or more classic fare? As a kid, there were collections of myths and scary stories that I read multiple times. Check out my booklist packed with short story collections and quick reads for elementary through high school readers. Have fun adding titles to your to-read pile, and feel free to leave your short story recommendations in the comments below! Stormchaser is a teen who lives in a world ravaged by hunger and disease. Food is scarce, and an illness that starts with the blistering and peeling of one's skin soon leads to death. In her world, a few dinosaurs still exist. Stormchaser has befriended a plesiosaur she's named Milo. This is a secret she must guard closely because dinosaurs are universally hated. When the Trials are announced, Stormchaser enters on a whim; she doesn't have a family, doesn't have anyone dying from the plague like the others. The contest is a deadly one: enter the area of the world known as Piloria, where the dinosaurs are abundant, and retrieve as many dinosaur eggs as possible. The winner will receive health care and food, two things essential in order to survive their daily nightmare. She's joined on the Trials by Lincoln and Leif, two boys with a lot on the line. As the competition heats up, they must learn to trust each other if they're going to avoid being eaten alive. But as Stormchaser soon learns, you can't really trust anyone in the Extinction Trials and what she finds hiding under the surface of Piloria will change her life forever. 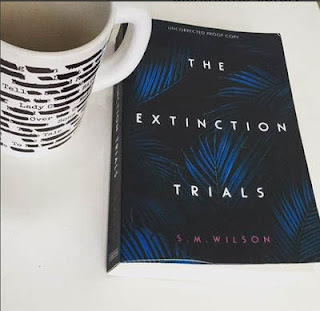 The Extinction Trials is a super fast action adventure that anyone looking for a strong female hero will love. It's got elements of The Hunger Games without a doubt, and that's a good thing because it means it will make my job as a School Librarian all the easier when I promote this book in the coming weeks. And promote it I shall, because it's got some great scenes, fully realised characters and a ton of action. Highly recommended, can't wait for the sequel! Emmett is a humble teen from Detroit. His family has been downtrodden for generations, working menial jobs after menial jobs and he isn't showing much to prove that he can break the cycle that has plagued his family. One day however, he gets a chance to go to a strange planet to work with an alien people called Adamites. However, there's a catch- he is going to have to compete for his spot against teens from around the world each as hungry as he is to make the cut. Babel, the company who is sponsoring the trip promises a big payout if they can succeed. Thus begins a gauntlet of events in groups and alone that sees the teens become hardened and their skills improve. The group has many distinct personalities some of which don't mesh and the inevitable conflicts arise. 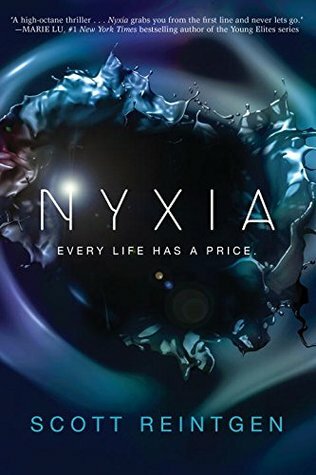 The tasks the kids are asked to do test their limits in many ways but perhaps the most difficult is manipulating the alien substance, nyxia. For some reason the substance also reminded me of the alien symbiote that Spiderman encountered in his whole Venom story arc because soon the line between manipulator and that which is being manipulated becomes blurred. Babel is a mysterious company and the folks in charge seem to have a ton of secrets themselves. There definitely seems to be some larger plan in place-the reason the kids have been recruited is because the Adamites like children. I can't wait to see what else is in store for Emmett on Eden. Some read alikes to this book are the Maze Runner series and Philip Reeve's Railhead. Mark Twain famously said (or, more likely, famously didn’t say), “History doesn’t repeat itself, but it often rhymes.” This truth is made clear in Jennifer Latham’s searing young adult novel, Dreamland. What rhymes with all too much clarity in Latham’s story is how our nation continues to fall far short of its aspirational tale of freedom and justice for all. 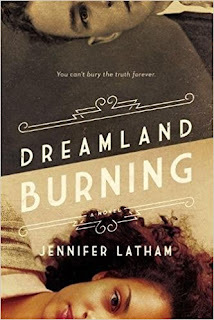 Dreamland is the tale of one city in two different time periods, one historical and one present-day. That city is Tulsa, Oklahoma, and the historical time period is one that has been whitewashed out of too many history books. "Onion John" is what the locals call the strange, sort of derelict man who hardly talks. "The way John spoke was his own secret. Most of the words he used were full of x's and z's and noises like ptchky and grvtch. It was a high speed language full of jokes, from the way he carried on. Every so often, talking away, he'd get too much for himself and bust out. There was no way of telling whether the jokes were that good or not. The only part of his conversation I ever understood was the end of it. He said, "Well, good day," each word separate and clear and then you knew he was finished with whatever he was telling you." The story is narrated by Andy, a young teen. His folks don't forbid him to befriend Onion John, but they think Andy should focus on his studies, go to M.I.T., become an engineer, and/or be an astronaut. I don't want to give away the plot, but will say this: The author won the Newbery Medal twice, which doesn't happen a lot. This one was good enough that I look forward to reading more Joseph Krumgold stories. This book. This book is grounded inside its main character's mind and body in an almost visceral way, and if you've ever had a "crazy" friend--and who hasn't, but I mean one who is actually diagnosed with anxiety disorder and/or OCD--even though this book is entertaining and wonderful and all the things good fiction should be, it will help you to "get" them in a way they might not have been able to articulate to you. Aza is the star of the show. Or maybe she's not. She's so stuck inside her head, where twisty thoughts and logic have her spinning about the bacteria in her body and how it might just take over and kill her, that maybe she's the victim. Worse, maybe she is the bad guy. And the victim. And the star. Aza is lucky in that she has a best friend, Daisy. Daisy, who talks all. the. time. but who sticks by Aza even though Aza isn't easy to stick by. So when Daisy suggests that she and Aza make like Nancy Drew and Trixie Belden to solve the mystery of the missing billionaire, Aza goes along with it. Things happen. So many things. And I don't want to talk about any of them, really, because it would spoil this book, which unspools almost magically. It starts from a very clenched place and almost literally unwinds to a a better stasis. Read it. Read it to find out what role Aza plays in her own life. To see if she can find her way out of her own head, at least a little. And to find out what the title means: "turtles all the way down." So yeah - consider this review the equivalent of me standing next to you, shoving this book into your hands, making almost uncomfortable levels of eye contact while imploring you to read it. Guiluli is a Red Mighty, a mutation of humans born from the Corporate World War. After 54 years of existence, Pre-ev (non mutated) humans still don't much like the Red Mighties and as a result, the Red Mighties have created their own Nationland. Despite all of the world's natural resources being either consumed or poisoned by the war, the Nationland has cleaned up its land, so they have pure water and soil free of contaminants in which to grow food. Yet another reason for those off the Nationland to dislike the Red Mighties. I like the idea of the evolved/mutated species emerging from a human race destroyed by its own vices and desires. It seems that hominids may be ripe for another evolutionary step, after all we have been homo sapiens for a while now. Maybe this is the next step. This is an interesting twist on a typical dystopian novel in that I feel there is way more hope of a future that isn't just trying to exist day to day but actually thrive as a civilization. The possibility of cleaning up what we have destroyed. 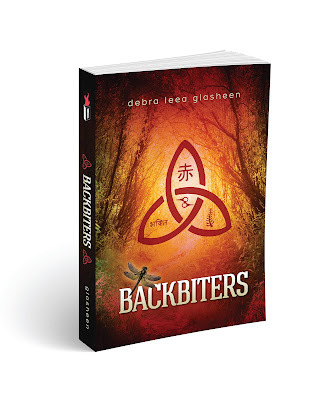 Backbiters is a great read for those that enjoyed the Hunger Games, Divergent, Not a Drop to Drink.